The volume of passenger transport in Slovenia has been increasing; primarily on account of the most non-sustainable transport mode – car transport. In the last decade, the share of bus transport has strongly decreased, while the volume of rail passenger transport started to decrease after a long period of slow growth; since 2002, the number of air passengers has been increasing sharply. The indicator shows the modal split in passenger transport in the Republic of Slovenia and in the group of selected European countries. The data for Slovenia indicates the development of passenger kilometres in bus, rail and air transport and the development of the number of passengers in municipal public transport in the period 1990-2007; the data for the group of selected European countries indicates the shares of use of transport modes in passenger transport for the period 1990-2003. Statistical Office of the Republic of Slovenia: Statistical Yearbook of the Republic of Slovenia 1996-2010 and SI-STAT Data portal, 2011. The modal split in passenger transport is an important indicator of the functioning of the transport system, since it indicates to which extent and by what mode residents of a country, region or town actually travel. The selection of transport modes is important due to the differences in environmental, economic and social effectiveness of individual transport modes and consequently the different impacts of their use. The monitoring of travel patterns of residents and the balance between the use of various transport modes is difficult in Slovenia due to the lack of appropriate data. There is no accurate data on the volume of car transport in Slovenia as well as no complete review of the modal split in passenger transport. 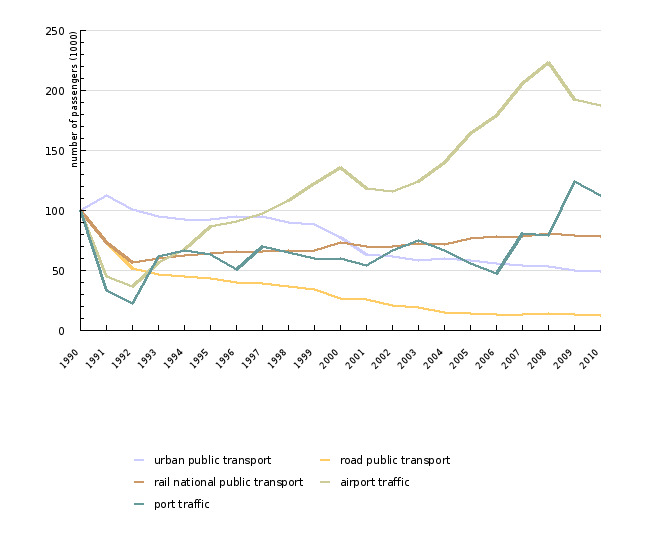 Nevertheless, according to the increase of GDP, lower public transport demand, increase in motorisation, energy consumption in transport, burdening of road infrastructure and policies in the countries with available data, we can come to the conclusion that the entire volume of passenger transport is increasing; primarily due to the faster growth of the use of passenger cars. Furthermore, this is also confirmed by the assessment of the volume of transport by passenger cars, prepared annually by the Slovenian Roads Agency. According to this assessment, 10.1 billion passenger kilometres with passenger cars were travelled on Slovenian state roads in 2007, which is almost 4 % more than a year before and one third more (33 %) than in 1997 (Slovenian Roads Agency, 2009). This assessment is based on the calculation from the length of state road network and its average burden by passenger cars. However, this is only a rough assessment of the transport part, which does not consider the actual length of travelled kilometres and transport on other (local) roads in the country; therefore, it is not an appropriate compensation for the data that would be obtained by a national transport study. According to the volume and growth, other land transport modes (buses, trains) are still behind the transport by passenger cars. The situation is especially concerning in bus passenger transport, since in the last decade the number of passengers in inter-urban bus transport dropped by 63 % and in urban bus transport by 43 %. 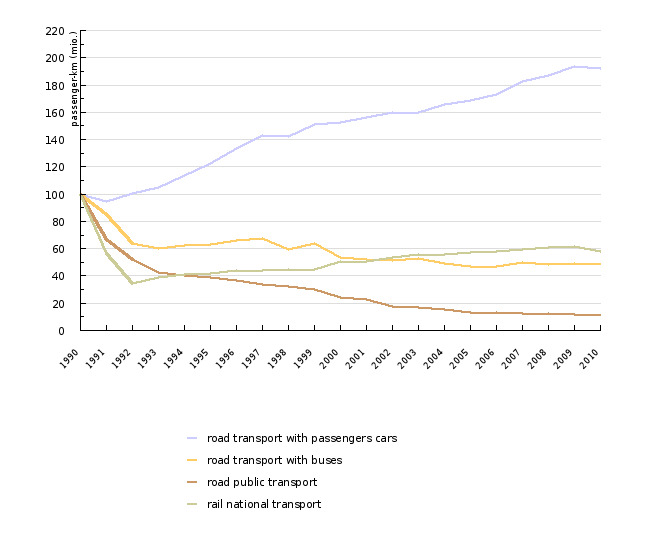 Rail passenger transport has been slowly increasing again after a vast decrease in the 90's. On the other hand, the number of air passengers has been quickly increasing in the last few years(in 2007 by 14 %)due to the entry of Slovenia into the EU and the Schengen area and the arrival of low-cost air carriers (Aerodrom Ljubljana, 2009). Numerous indicators (development of motorisation, investments in infrastructure, changes in locations of settlement, non-competitiveness of public passenger transport, etc.) indicate a continuation of extreme “automobilisation” of passenger transport in Slovenia. The state and the local communities have contributed to this by encouraging such development by their methods of solving the transport problem. Nevertheless, the situation in urban areas, which are as settlement areas mostly burdened by transport and its impacts, is forcing the local and state administration into different types of action. Therefore, the initial shift to sustainable development of transport can be expected at local level in urban areas. 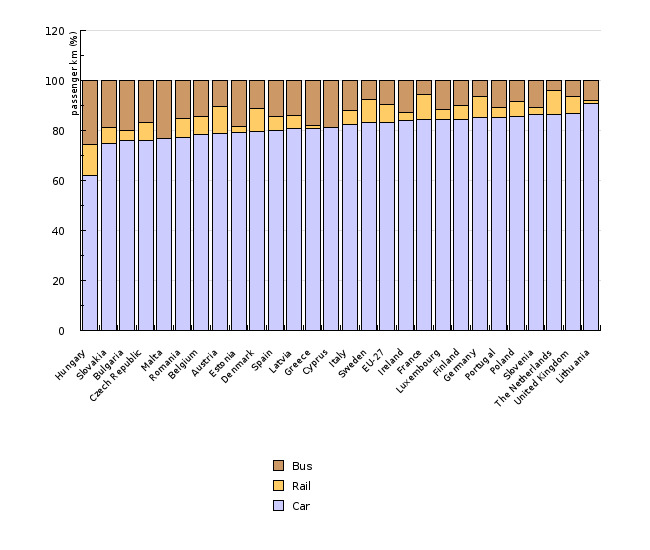 The use of passenger cars is prevailing also in the passenger transport at the EU level (in 2003, 75 % of passenger kilometres in the EU-15, 74 % in the EEA-23 and 73 % in the EU-5). The strong increase in air passenger transport after 1990 has been environmentally very significant, while the share of passenger kilometres by buses and trains has been slowly decreasing (EEA, 2006). Source database or source: Statistical Yearbooks of the Republic of Slovenia 1996–2008. Data administrator: Statistical Office of the Republic of Slovenia (SORS). Methodology and frequency of data collection for the indicator: The data on the modal split in passenger transport in Slovenia is collected by the SORS and published in the regular annual serial publication “Statistical Yearbook of the Republic of Slovenia”. The data on rail transport is reported by Slovenske železnice (Slovenian Railways); since 2004, the data on road passenger transport in public transport is reported by business entities registered for this activity, having a concession contract for the provision of public utility services and performing the public regular transport of passengers in road transport on at least five routes in accordance with the Road Transport Act. However, the transport of passenger performed by private entrepreneurs, taxis and passenger cars is not considered. The data on air transport includes only the largest Slovenian air carrier, which is becoming a huge deficiency due to the increasing share of other air carriers on our market. Therefore, the data in the comment is supplemented by the data on the number of passengers at Jože Pučnik Ljubljana Airport. The data on urban passenger transport refers to transport in Ljubljana and Maribor, and since 2004 also to transport in some other towns with organised urban passenger transport. Data processing methodology: The modal split in passenger transport is expressed by the indicator of passenger transport demand – passenger kilometres. A passenger kilometre (pkm) is the sum of the multiplication of the number of passengers and distances, on which the passengers were transported (SORS, 2004). The volume of passenger transport is expressed by the sum of all travelled passenger kilometres in the considered area and in the determined time period; the structure is expressed by the share of passenger kilometres by individual transport modes (modal split). - Advantages and disadvantages (at data level): The fundamental disadvantages of the indicator is that the data on the volume of transport by passenger cars in Slovenia, similarly to the case in the majority of other new EU Member States, has not been collected. Furthermore, another disadvantages of the indicator is that the data on air transport includes only the largest Slovenian air carrier. - Relevance, accuracy, robustness, uncertainty (at data level): With the exception of air transport, the data is considered as fairly reliable and accurate. Methodology and frequency of data collection for the indicator: The EEA has been obtaining data on the modal shares in passenger transport from the common questionnaire, prepared by Eurostat, the European Conference of Transport Ministers (ECMT) and the United Nations Economic Commission for Europe (UNECE). Since 2003, the data on rail transport within the EU has been collected separately on the basis of the EU Regulation on Rail Transport Statistics (EC no. 91/2003). Data processing methodology: The missing values were obtained by methods of linear interpolation and extrapolation and by considering the situation in neighbouring countries with a similar level of development in passenger transport. Geographical coverage: The EEA-23 includes the group of 23 countries for which sufficient data is available. This group is composed of the EU-15 Member States (Belgium, Denmark, Germany, Greece, Spain, France, Ireland, Italy, Luxembourg, the Netherlands, Austria, Portugal, Finland, Sweden and the United Kingdom), 5 new EU-5 Member States (Poland, Czech Republic, Slovakia, Slovenia, and Hungary), plus Norway, Iceland and Turkey. - Advantages and disadvantages (at data level): The data on passenger-km is estimated and not directly recorded. However, since the same methodology has been used for many years, the trends generally give a good indication of the developments in passenger transport demand. - Relevance, accuracy, robustness, uncertainty (at data level): Data is considered to be fairly reliable and consistent for the EU-15; for Central and Eastern European countries the data is generally much less reliable and much less comparable. Completeness over space: 2 (certain differences between countries by not considering some transport modes). - Ljubljana Airport, 2009: Transport (23 June 2009). - Slovenian Roads Agency, 2009: Performed kilometres in the period 1997–2007 on state roads in the Republic of Slovenia. Ljubljana, Slovenian Roads Agency (23 June 2009). - SORS, 2004: Glossary for Transport Statistics. (UNECE, ECMT, Eurostat). Ljubljana, Statistical Office of the Republic of Slovenia (23 June 2009).